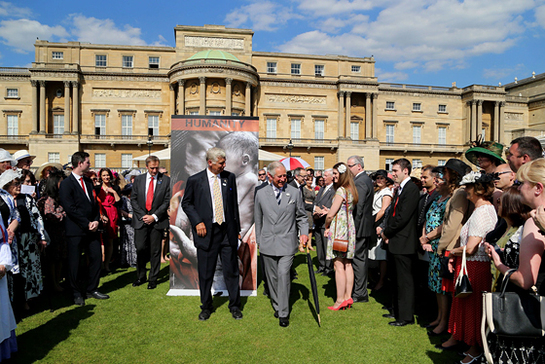 The Prince of Wales, President of the British Red Cross Society, was joined by Princess Alexandra, the Society’s Deputy President, for a Garden Party at Buckingham Palace last week that made the most of the warm summer sunshine. The event was to mark the work of the Red Cross over more than 150 years and its efforts 100 years ago during the First World War. Around 6000 of its supporters, volunteers, and full-time staff from across the country were invited. Other volunteers also dressed in vintage wartime nurses’ uniforms joined the guests and Princess Alexandra stopped to talk to one in French. Garden party guests are usually served a selection of sweet treats but at this event they were given an unusual delicacy in the form of a cake made from a First World War recipe. Staff from the Royal Kitchens made a fruit cake from a recipe given to the Red Cross by a Mrs J Laing of Herefordshire in 1988. It was created by her great aunt Mary, who was a Voluntary Aid Detachment stationed at Badminton House, Gloucestershire for most of the Great War. She made the cake and gave slices, with a cup of tea, to soldiers on the troop trains. Towards the end of the Garden Party the guests were entertained by military bands, dancers and singers from the organisation Zulu-Tradition, from the KwaZulu-Natal region of South Africa. The British Red Cross has an integrated HIV and TB project based in Kwazulu-Natal, working with communities to fight the epidemic and provide support to those living with HIV and TB in a way that is sustainable and long-lasting.